The Global Center, Oxfam America, and the Somali Money Services Association (SOMSA) co-hosted a roundtable on the issues of derisking, anti-money laundering/countering the financing of terrorism, and Somali remittances. 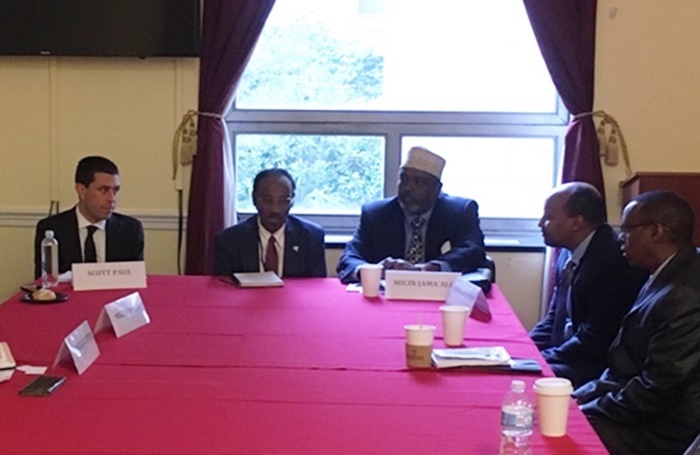 The event, which was hosted in coordination with the office of Congressman Keith Ellison of Minnesota, included representatives from the Federal Government of Somalia, Somali money transfer operators, and U.S.-based civil society and policymakers on Capitol Hill. Participants noted that as Somali money transfer operators lose their bank accounts, Somali families lose their only formal and transparent channel through which to send money. As a result, transfers to Somalia have increasingly moved from wire (monitored) to cash, driving some legitimate flows underground to unregulated channels. Within Somalia, improved dialogue between the Somali money transfer industry and regulators has been very helpful in enhancing regulation of the sector and ensuring compliance with international standards. Representatives of the Somali money transfer industry highlighted their investments in improving compliance and standardization of customer identification systems. All participants emphasized the need for enhanced and institutionalized dialogue between Somali money transfer companies, international correspondent banks, and regulatory authorities is needed for remittance corridors to Somalia to remain intact.